I'm working on a new webpage layout to replace this one - please be patient. Back from a five weeks combined bike-and climbing trip in Bolivia/Chile. Biked some 1100 km. from La Paz down to San Pedro de Atacama in Northchile. 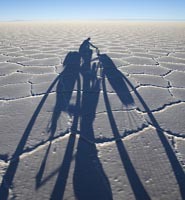 Biked across the biggest salt flat on earth - 12.000 km2 - called Salar de Uyuni - looking like a place from outer space. Ran into hurrican-type headwind one day - frustrating insane sandy roads other days. Soloclimbed an old stratovolcano called Aucanquilcha, 6195 meters - had a old very bad mine road to the summit - a good candidate for being the highest road ever constructed - so I had to bring my bike along. The day after coming down I soloclimbed Bolivias only active volcano - Mt. Ollague - on the border to Chile in one day (5840 meters). Was deadtired after ascending 2100 meters up and down again. Three Chilian police men were waiting for me in a police pickup-truck at night two km outside town because an old guesthouse owner had gotten worried for my safety but they were in good mood since Chile had beaten Denmark in football the day before. Biked the wrong way near the Chilian border and was warned about landmines before I suddenly ran into a fenched area in a narrow gorge with a open gate - deadscared while pushing my bike through. Was later hanging out at El Titao - Chiles biggest geiser area. Back in La Paz I became lazy and joined a commercial bike tour down the socalled Death Road - 3500 meters decent down to the jungle from a 4600 meters roadpass - 3 out of 10 in the group crashed - one broke his hand - another had to be sewn. Earlier this year a English cyclist and a guide had fallen to death here. Following that I climbed 6088 meters Huayna Potesi outside La Paz at night while sensing the heavy clowds over the Amazon jungle not far away and at the same time looking at the dazzling nighttime light over La Paz. It may not be Tibet but surely I will come back to Bolivia again! "Mountains are not Stadiums where I satisfy my ambition to achieve, they are the cathedrals where I practice my religion...I go to them as humans go to worship. From their lofty summits I view my past, dream of the future and, with an unusual acuity, am allowed to experience the present moment...my vision cleared, my strength renewed. In the mountains I celebrate creation. On each journey I am reborn". Been on a 10 days trip to Tanzania for a climb of Africa's highest mountain, mt. Kilimanjaro. Wasn't too difficult but it was somehow nice to try something different. Biggest challenge was to get onboard the plane from Denmark at 6 in the morning after being sick and throwing up half the night. We didn't see any human beings for 39 consecutive days and summited two unclimbed mountains, 6388 m. and 6436 m. - the first peak standing as a good candidate for being one of the most remote and inaccessible mountains in the world. I lost 13 kg. during this trip there the level of food was running low by the end. Started out with some 37 kg. of food on the bike but had 40 grams left when we met the first humans again. The bike was at one point about 94 kg. heavy while loaded with 10 l. of water and 4 l. of gasoline. During the trip we crossed as the first westerners through an area which has just been announced to be the world's most remote place (outside Antarctic, I assume). It's official, the world's most remote place is on the Tibetan plateau (34.7°N, 85.7°E). From here, says Andy Nelson, a former researcher at the European Commission, it is a three-week trip to the cities of Lhasa or Korla - one day by car and the remaining 20 on foot. Rough terrain and an altitude of 5200 metres also lend it a perfect air of "Do Not Disturb". "All true wisdom is only to be found far from the dwellings of men, in the great solitudes; and it can only be attained through suffering. Suffering and privation are the only things that can open the mind of man to that which is hidden from his fellows". (Igjagarjuk, Greenland). I try to look elsewhere but often find myself in barren parts of the Tibetan plateau on my bike amongst mighty unlimbed mountains or on rough high-altitude plains, places I lost my soul to. I am absolutely devoted to the brutality and beauty of the uninviting upper floor of Tibet called Chang Tang scattered with undisturbed wildlife, untouched mountains and untrotted grounds. This enigmatic fairy tale land containing absolutely unfenced freedom regularly floats through my mind and veins when trying to escape the triviality of modern life at home. 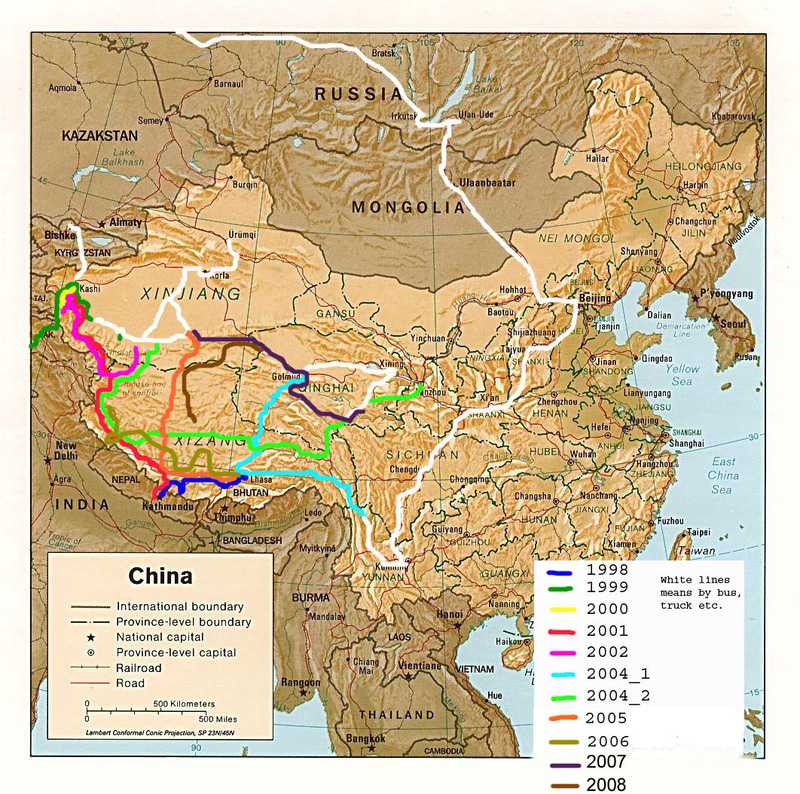 Chang Tang is located in Northern Tibet and has been labeled as one of the last practically unexplored places on earth by wildlife biologist George Schaller and is bigger than the size of Germany. This perma-frozen, windswept, treeless wilderness dotted with large brackish lakes offers too harsh living condition for even the hardy Tibetan nomads to survive and is therefore completely uninhabited. Local wildlife like Yaks, Tibetan bears, Chirus (the Tibetan antelope) and wolfs are the kings of this 5000 meters area. The harder a journey have been, the more I have enjoyed it afterward and opposite. 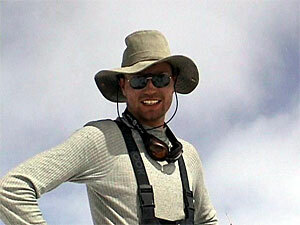 My main and strongest inspiration source is explorer Sven Hedins accomplishments in Chang Tang one century ago. In total I have done 9 bicycle trips in Tibet and cycled more than 19.000 km. 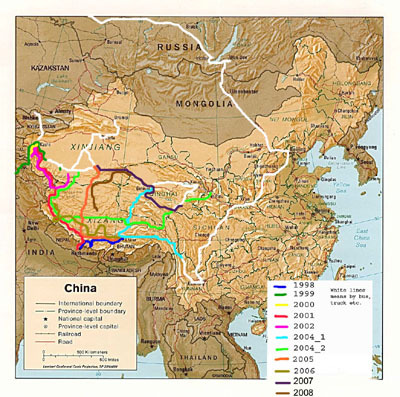 on the Tibetan plateau. In other catagories I could mention climbing Mt. Aconcagua (6965 m), Mt. Kilimanjaro (5895 m), three unclimbed 6000+ mountains in Tibet, hanging around on a bike at 7.008 meters, cycling in Argentina, Chile, Nepal, Pakistan ect. 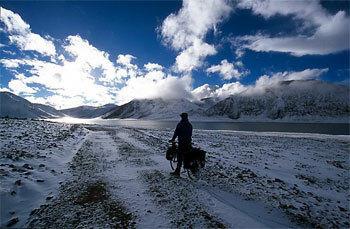 I will go back to Tibet again for cycling but might first go for a short trip to Bolivia for cycling. Next winter is dedicated a 2.000 km bike trip on the bone road / Kolyma road in Eastern Siberia with a visit to the coldest town on earth. A trip across the Greenland Inland ice has been postponed till spring 2010. - cycling at 7008 meters on Mt. 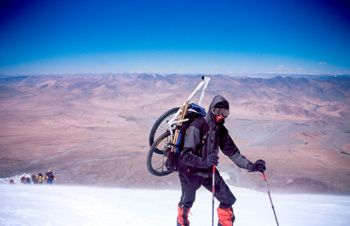 Mustagh Ata in Westchina's Xinjiang province to set a Guinness record in altitude cycling. Here I also set a personal record in biggest ascent by bike when cycling/carring the bike from 1300 meters altitude to 7008 meters, nearly 5700 meters climbed with my bike. For the Danes: Here a link to an article I wrote in danish for the Travellers Club Magazine. - done more than fifty 5000+ meters passes in total by bike. I love cycling really high passes - passes being over 5500 meters. I have done 8 different of those: see here for more details. - solocycling 1200 kilometres south down to Lhasa on the Golmud highway in ROARING headwind in January - the coldest month of the year in Tibet (had down to some - 35 C at night - the tempearture occationally drops down to - 45 C in this area). Mentally very draning. Lost 9 kg. in 24 days. - spending 4 days "cycling" over a 5604 meters mountainpass in No Man's Land in Northwest Tibet, a few days later followed by an insane 4 days, 30 kilometres long, 2600 meters deep descent (with less than ½ kg of food left) through a nightmarish rivergorge in the Kunlun mountains down to the outskirt of the Taklamakan desert. - before the little adventure above, we were escorted 20 kilometers out of the western part of Chinese Kashmir by furious Chinese military officers when we wanted to make a detour into a highly sensitive military zone in order to visit the legendary Karakoram trade pass. This attempt must mark the all-time topperformance for all Tibet cyclists in terms of optimisme, ignorance and naivity. - cycling on the Karakoram Highway in Northern Pakistan while the country was on the verge of war with India in 99'. Massive military convoys passing me, soldiers with deep empty eyes, locals talking about war within days. Interrogated by the Pakistani Intelligence Service for my presence in the area. Happy to arrive into China! 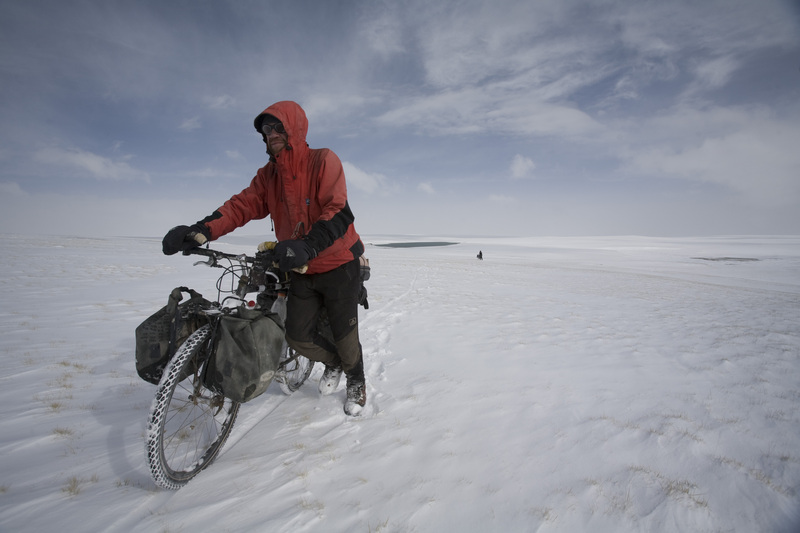 - cycling in a salt storm on the southern shore of a salt lake in northern Tibet. Had salt taste in my mouth even the day after. (please replace # with @). Whatever happens, I will come back to the Tibetan plateau from time to time. I know that. The plateau is an integrated part of who I am. But I don't want to be a monotraveller, I also want to go elsewhere. Unfortunately, the entire world has been congured by humans and mashins - a 6x6 landcruiser has been driven to the south pole - a helicopter has landed on the summit of Mt. Everest. However, despite being envious on past explorers unending uniqe opportunities, there are still some great adventures around and I will do my best to hunt down the ones I like. Ranking highest is a crossing of the inland ice on Greenland with pulk - maybe as a preparation of a bike trip to the south pole on the "road" established from the McMurdo base near the coast to the Scott-Amundsen base on the south pole. Dangerous thoughts some would say, but if I have to adapt fully to Danish welfare socity, being forced into a lifetime 9-4 office job, it will become my death! I need space - I need full-on adventure - no more no less.